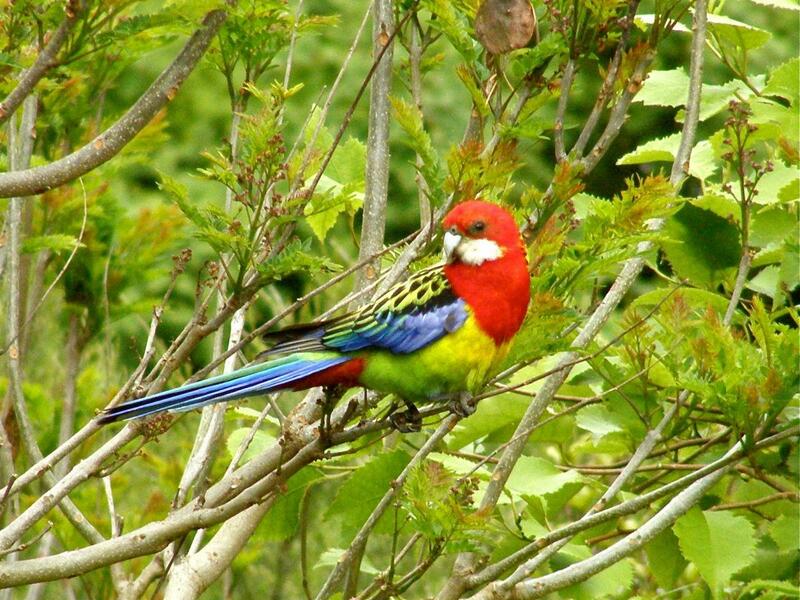 The eastern rosella is a brightly coloured, broad-tailed parakeet native to south-eastern Australia. It was introduced to New Zealand in the early 1900s, and is now common over much of the North Island, with a smaller population centred on Dunedin. They typically move around the landscape in pairs or small flocks, often given away by their noisy chatter or loud, in-flight alarm call. 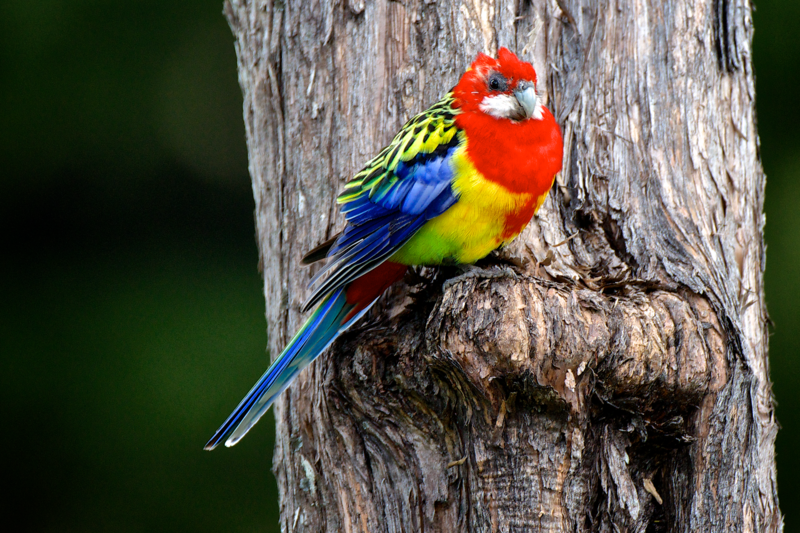 Eastern rosella are easily identified by their bright red heads, with white cheek patches. 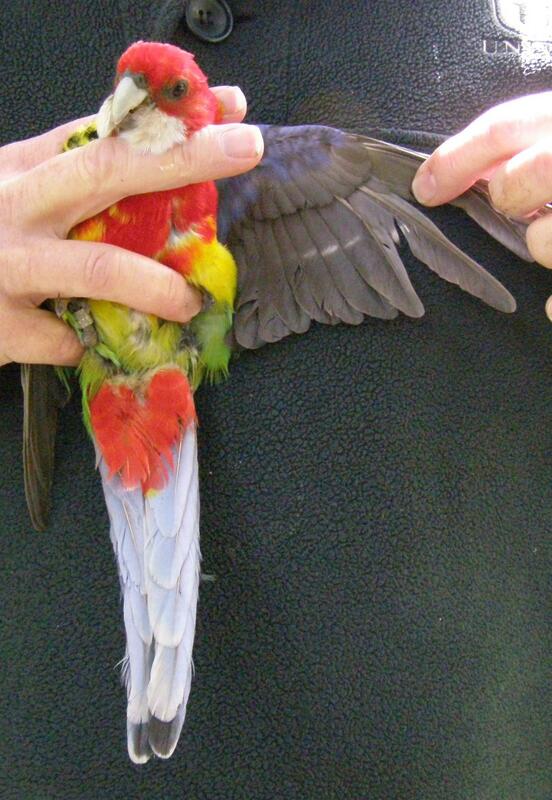 The red extends down onto the chest and forms a “bib”, giving way to a yellow belly. 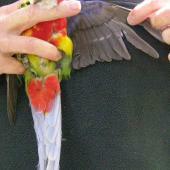 The upper back is yellow to green, with black patches in the centre of each feather. 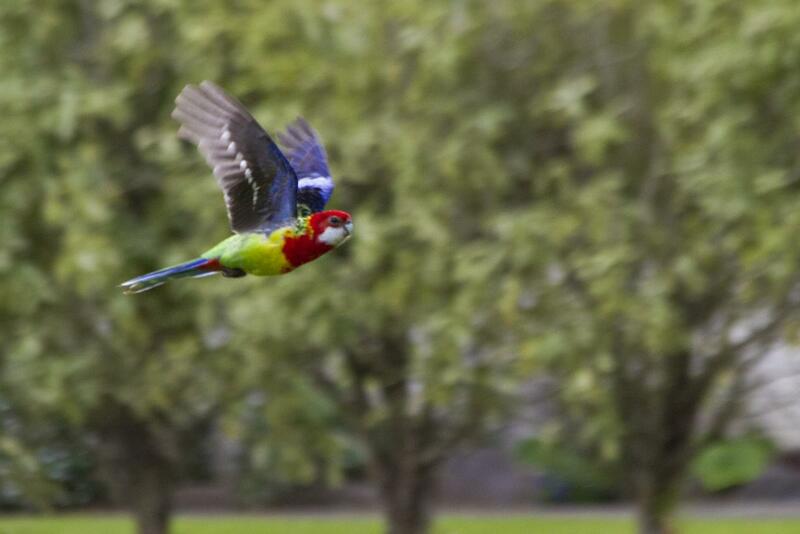 The rump is bright green, often observed when they are flying away. 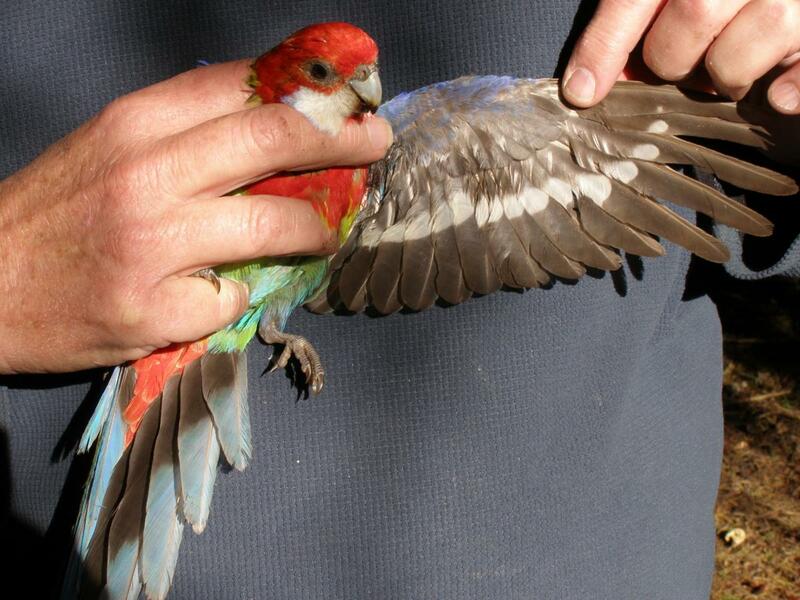 The upperwings are dark blue with bright blue shoulders. 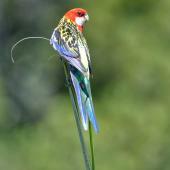 They have long tails, almost equal in length to the rest of their body – dark green in the centre, becoming light blue toward the outside. Males are typically brighter in colour than females. 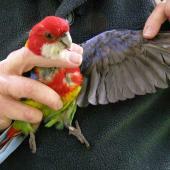 Juveniles are duller than adult birds, and their plumage is more green than yellow. 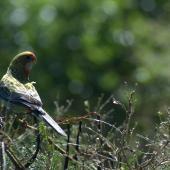 The green also extends up the back of the neck into the crown of the head, and their cheek patches may be pale blue. In juveniles, and variably in adult females, a white bar is present on the underside of the wing, which may be seen in flight. 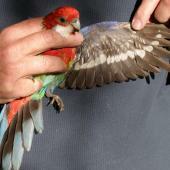 Voice: up to 25 different calls have been described for eastern rosella. 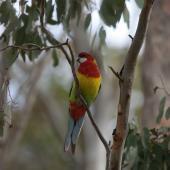 Most frequently heard are the unparrotlike “pee-ping” contact call, reminiscent of a bellbird; the in-flight alarm call – a metallic “pink pink pink pink”, and the noisy parroty chatter associated with intraspecific interactions. 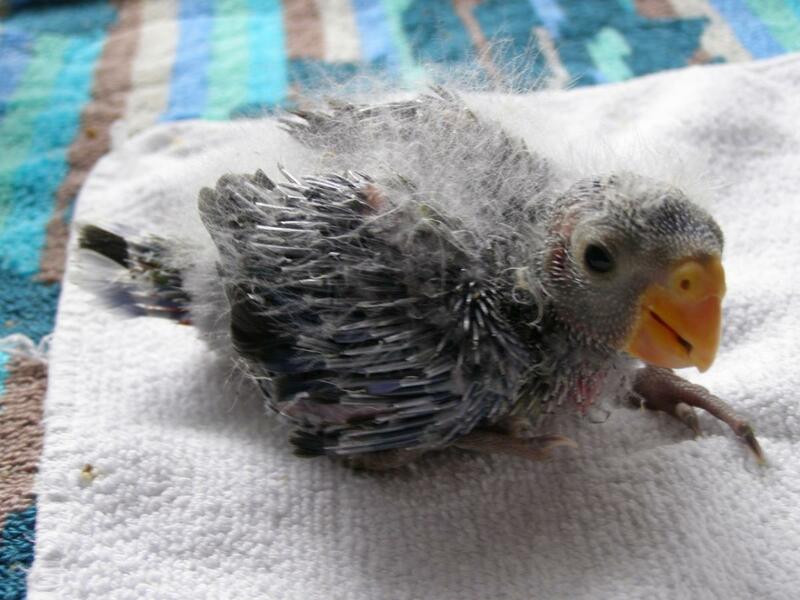 Juveniles and nestlings near fledging have a distinct “choy choy choy” call. 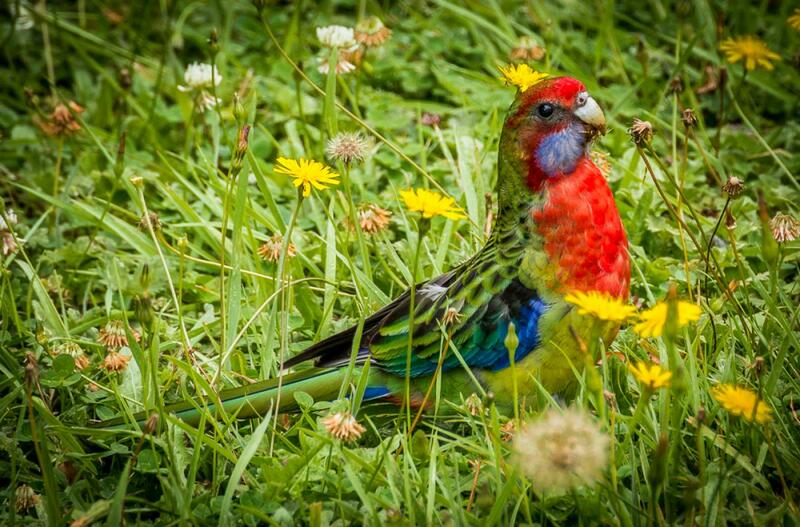 Similar species: eastern rosellas are often confused with rainbow lorikeet (Trichoglossus haematodus), another Australian parrot that has been the focus of eradication efforts around Auckland (and not considered established in the wild in New Zealand). 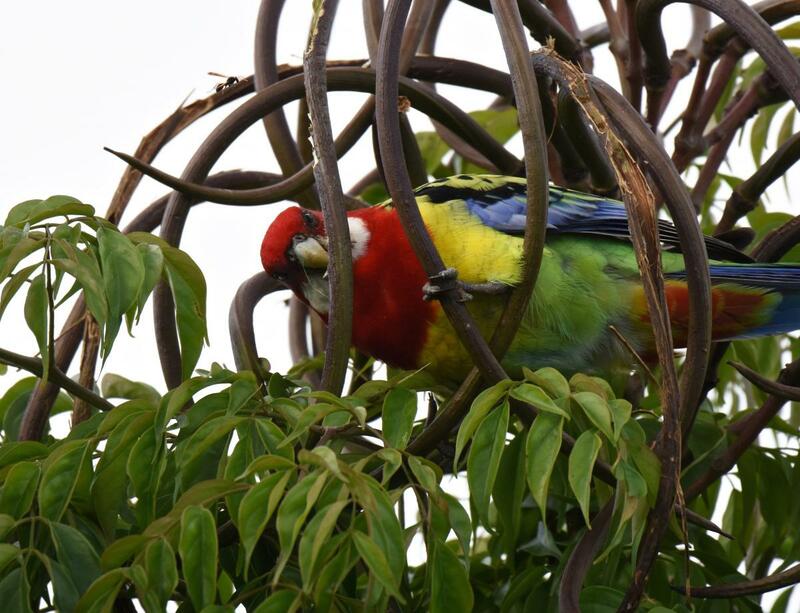 Rainbow lorikeets, a listed pest species, are distinguished by their blue heads and bright red beaks, and their contact call is a more piercing screech/whistle. 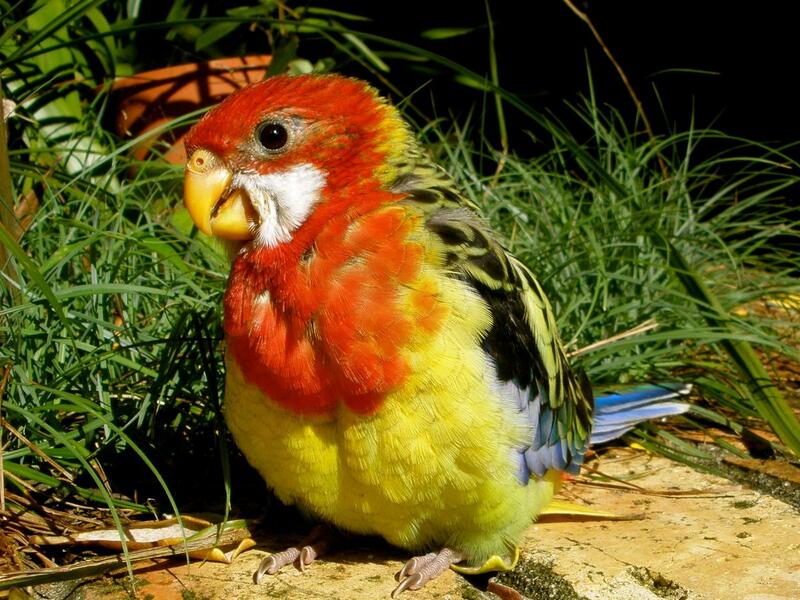 Crimson rosellas formerly present in small numbers in Wellington city are easily distinguished as adults, but juveniles are predominantly green and red. All ages differ in having blue cheek patches (cf. 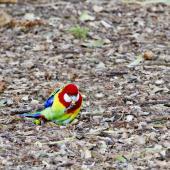 white in eastern rosellas). 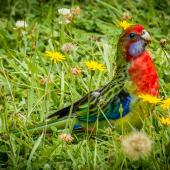 Eastern rosellas are native to south-eastern Australia, including Tasmania. They were introduced to New Zealand in the early 1900s, beginning with Dunedin in 1910, then Auckland (around 1920) and Wellington in the 1960s. The South Island population has remained relatively small, confined to the Dunedin area. There are isolated records from Lyttelton Harbour, Invercargill, and Stewart Island. The two North Island populations have spread considerably, and are almost joined in the Rangitikei region. 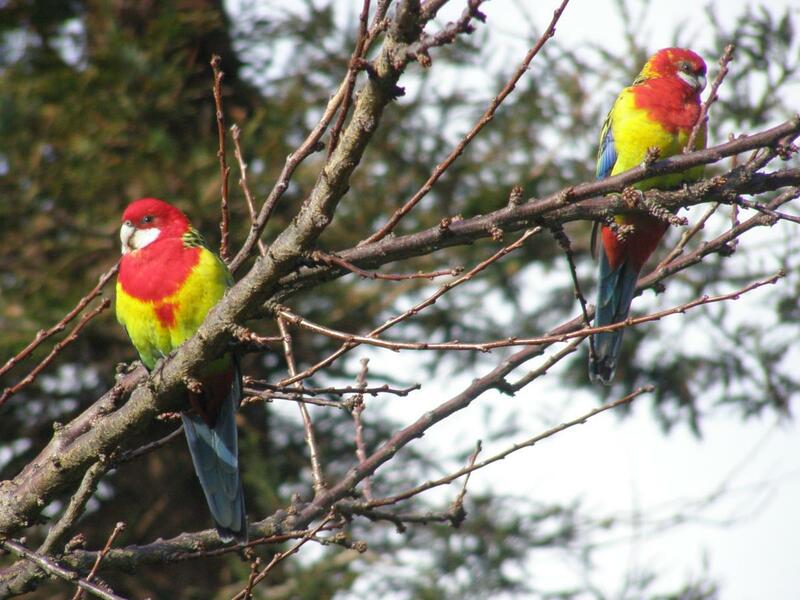 Eastern rosella are now common throughout many parts of the North Island, in particular Northland, Auckland, Waikato, Wairarapa and Wellington. 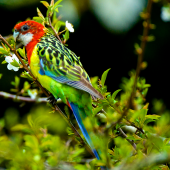 Eastern rosellas are mainly seen in open, partially wooded landscapes in New Zealand, including urban parks, gardens, golf courses, farmland, wetlands, and stands of exotic and native trees. 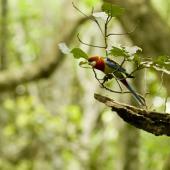 They use the edges of extensive native forest areas more than the interior. Individuals can move widely across the landscape to find and exploit certain food resources, and their home ranges often encompass several habitat types. 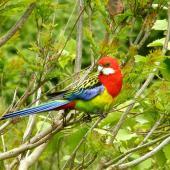 The eastern rosella is an abundant species that continues to spread in the North Island. No population estimates are available. 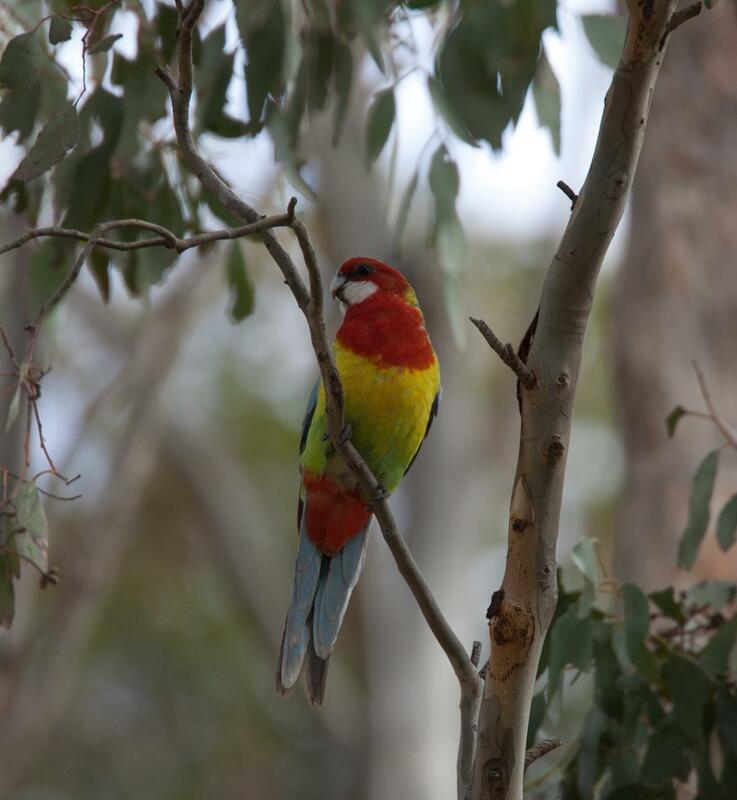 Eastern rosellas could potentially have detrimental effects for native parrots through spreading parrot-specific disease organisms not otherwise present. 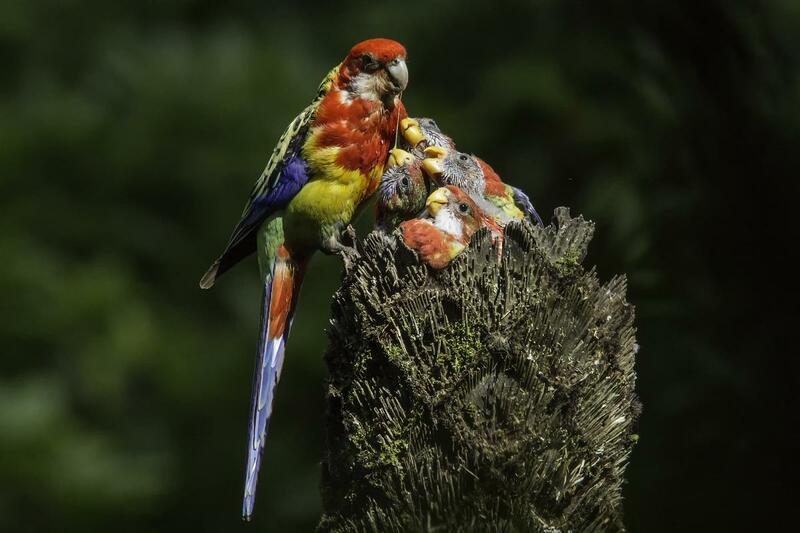 North Island rosella populations have been found to carry Beak and Feather Disease Virus (BFDV), a parrot specific virus which could be harmful to native parrots. 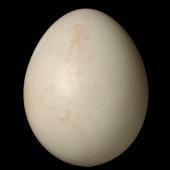 Additionally, they may compete with native species for food and/or tree cavities, which they nest in. 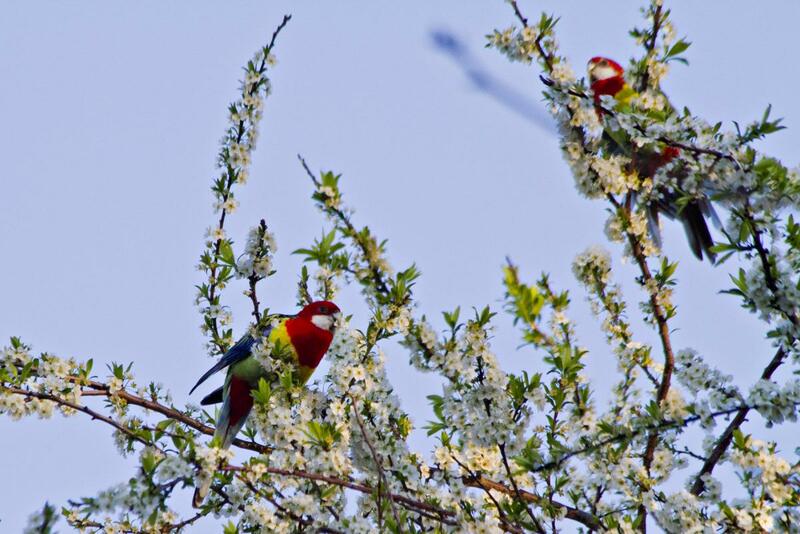 Rosellas cause localised damage to grain and fruit crops in New Zealand, including stripping flowers from some fruit trees. 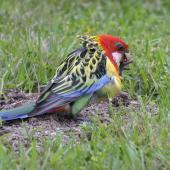 Eastern rosellas are cavity nesters – using holes in tree trunks or branches as nest sites. 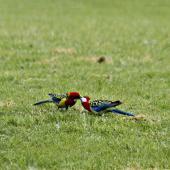 They form monogamous pairs, which remain together over multiple breeding seasons. From the end of August onward there is increased aggressive behaviour among individuals as loose flocks split into pairs. Pairs begin searching for suitable nest sites as early as September, inspecting potential cavities together. 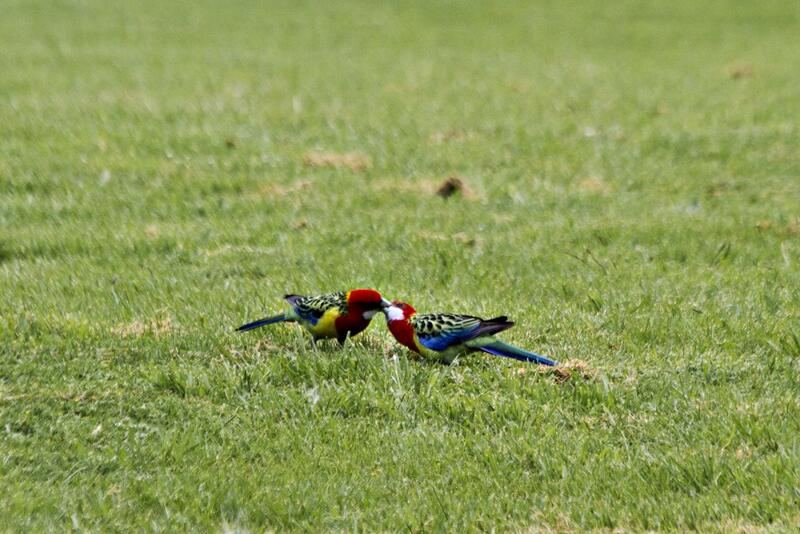 When a suitable site is found, pairs defend the area up to 30 m around the cavity. 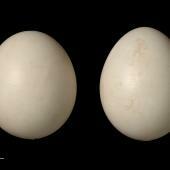 Eggs (4–7 in a clutch) are laid from October onward, typically one clutch per season, but two if conditions are favourable. 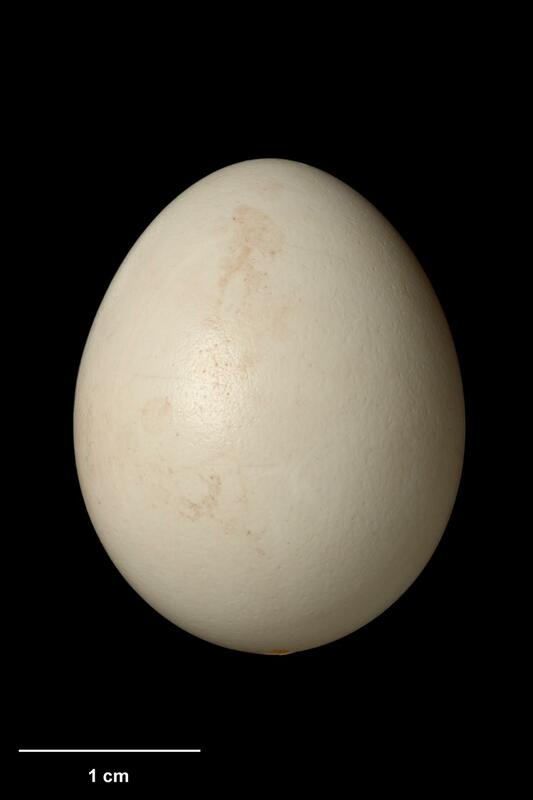 The female alone incubates, but is fed by the male near the nest. 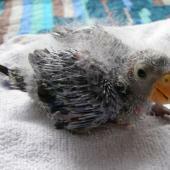 For the first 2 weeks after hatching the female alone broods the chicks and feeds them. 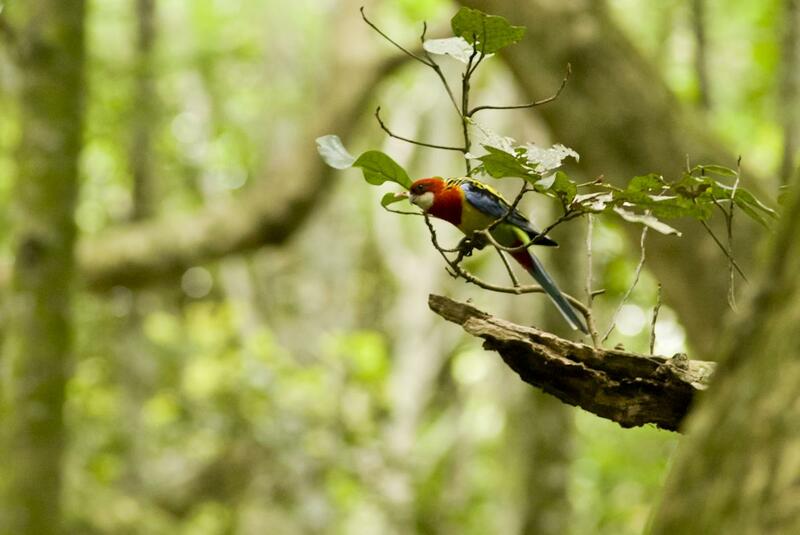 The male directly assists with feeding chicks for the remaining 2 weeks before fledging. A gregarious species, eastern rosella are often loud and conspicuous. 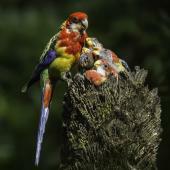 Interactions between pairs in the breeding season are usually noisy and aggressive, with birds chattering at and chasing each other, and performing the agonistic “tail-wagging” display. 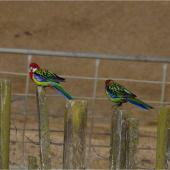 However, they are often on the losing end of interactions with other bird species in New Zealand (e.g. tui, kingfisher, myna and starling). 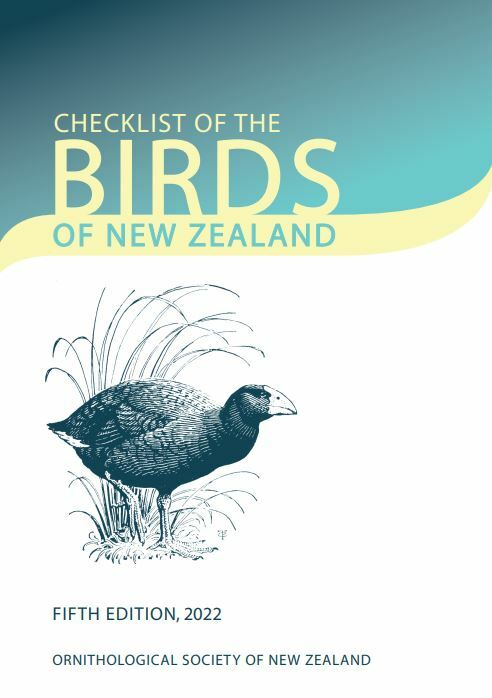 In winter, pairs and juveniles form loose flocks of 8–20 individuals (52 have been observed in a single flock near Wellington). Flocks forage together on open ground. 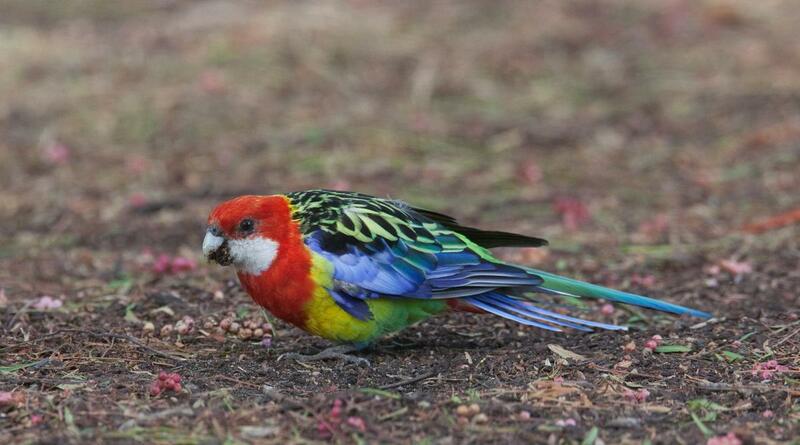 Eastern rosella have been observed feeding with red-crowned parakeets in a mixed flock on the ground. They are a very wary bird, particularly of people, and will take flight quickly if disturbed, flying swiftly with characteristic undulating flight. 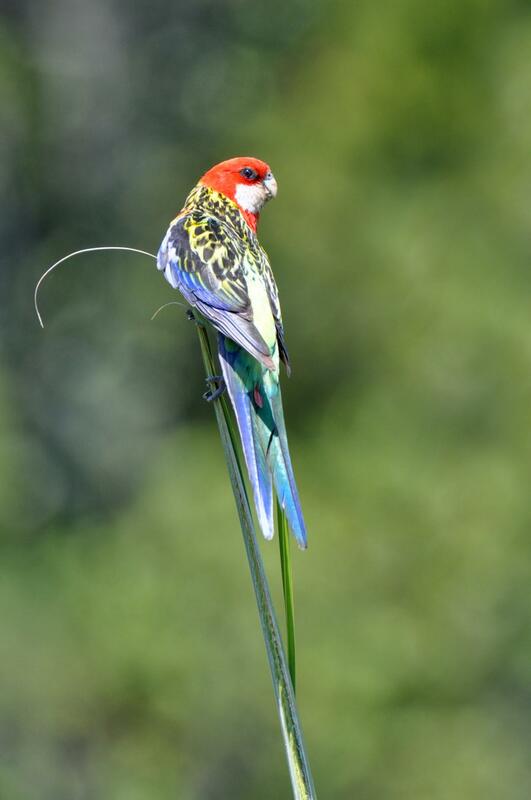 Seeds are a major component of the diet of eastern rosella. 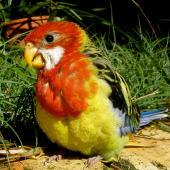 They also consume fruit, nectar, shoots, buds, leaves, and invertebrates (particularly during the breeding season). 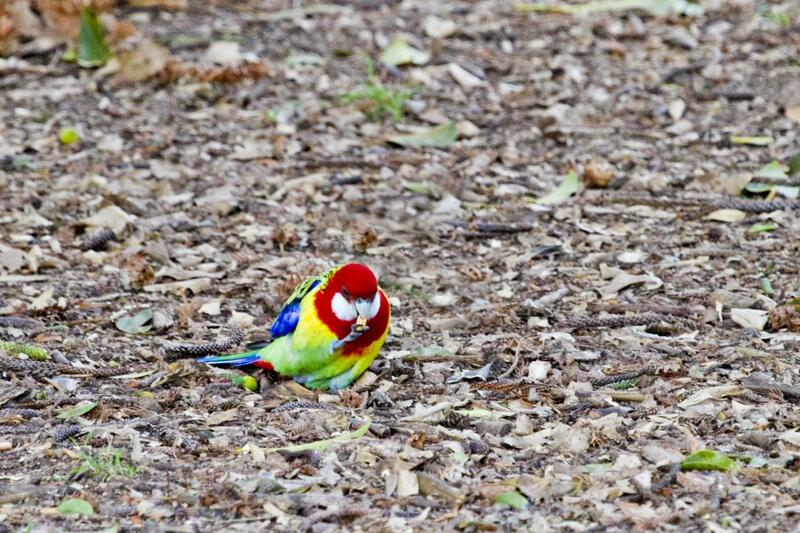 They often feed on the ground, but will also feed in trees. 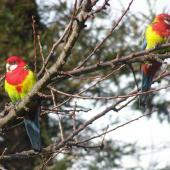 Birds forage alone or in pairs in the breeding season, and in small flocks in the winter. 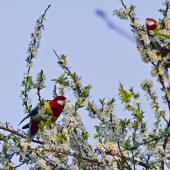 They have been observed feeding on the seeds of many native plants including flax, totara, and pohutukawa, and on the nectar from puriri flowers – destroying the flower in the process. Brereton, J.L. 1963. 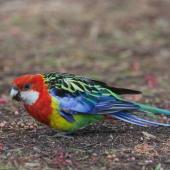 The life cycles of three Australian parrots: some comparative and population aspects. Living Bird 2: 21-29. Forshaw, J.M. 1989. 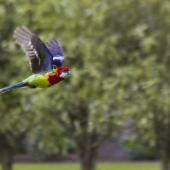 Parrots of the world. Blandford, London. Fraser, E.A. 2008. 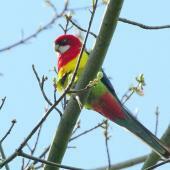 The winter ecology of the eastern rosella (Platycercus eximius) in New Zealand. Auckland: Unpublished BSc (Hons) dissertation, University of Auckland, Auckland. Galbraith, J.A. 2010. 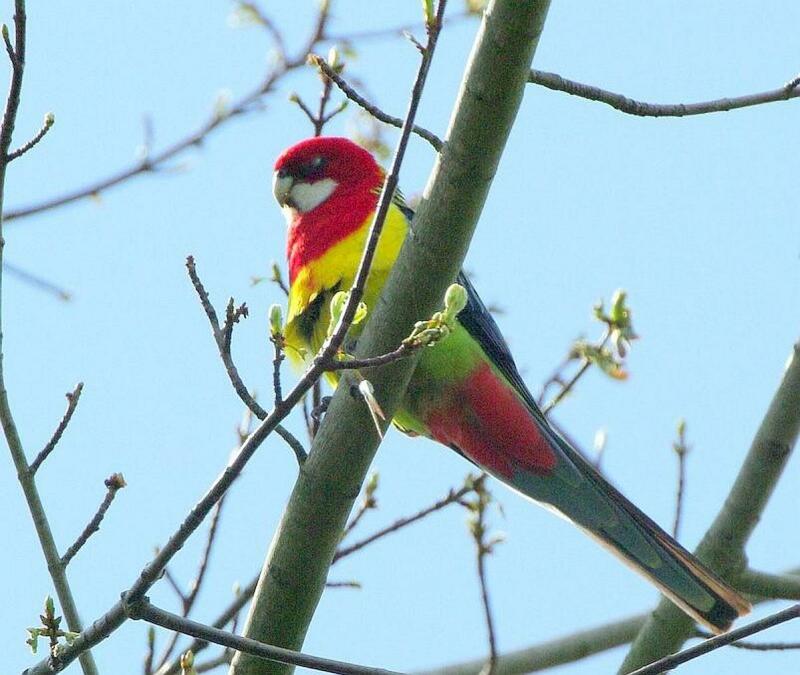 The ecology and impact of the eastern rosella (Platycercus eximius) in New Zealand. Unpublished MSc Thesis, University of Auckland, Auckland. Galbraith, J.A. ; Clout, M.N. ; Hauber, M.E. 2014. 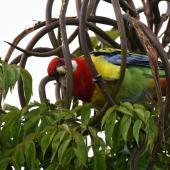 Nest-site use by an introduced parrot in New Zealand. 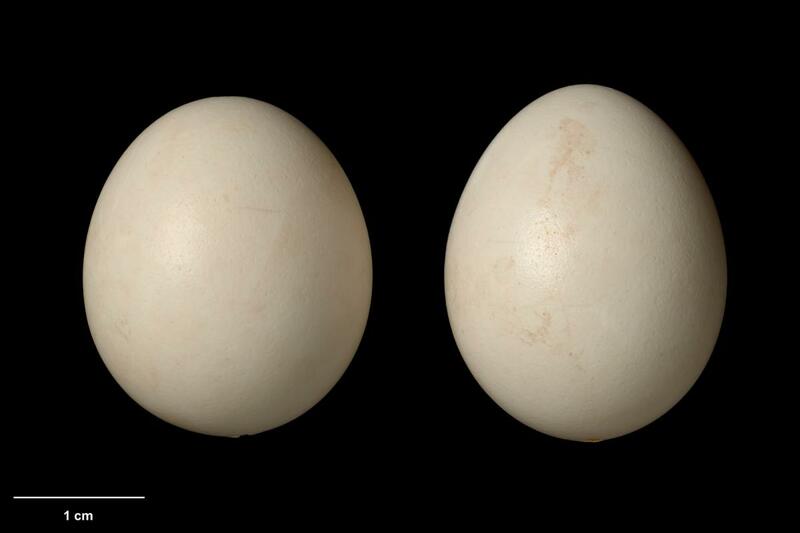 Emu 114: 97-105. Galbraith, J.A. ; Fraser, E.A. ; Clout, M.N. ; Hauber, M.E. 2011. 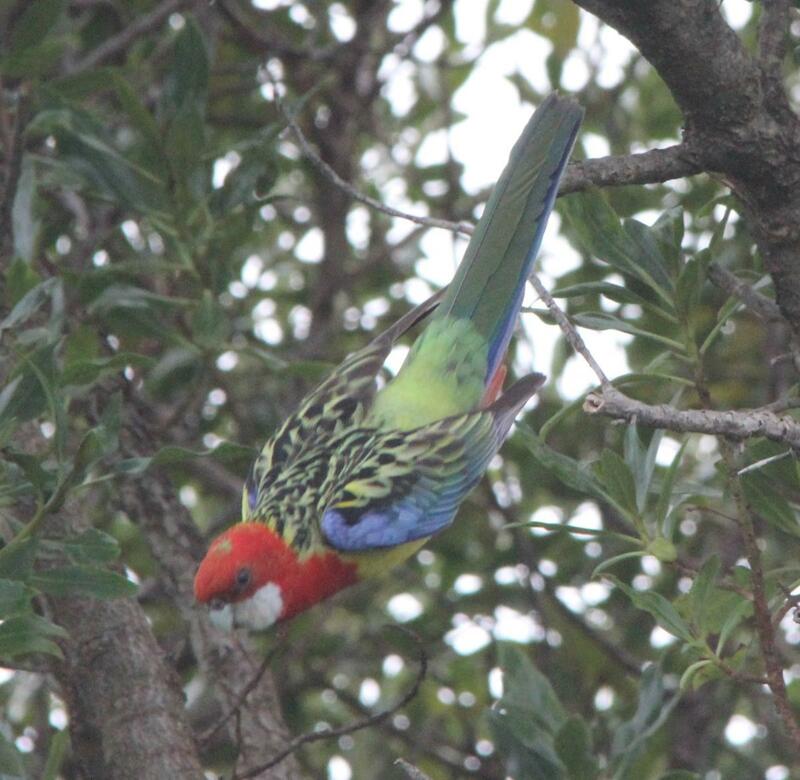 Survey duration and season influence the detection of introduced eastern rosella (Platycercus eximius) in New Zealand. New Zealand Journal of Zoology 38: 223-235. Jackson, B.; Harvey, C.; Galbraith, J.; Robertson, M.; Warren, K.; Holyoake, C.; Julian, L.; Varsani, A. 2014. 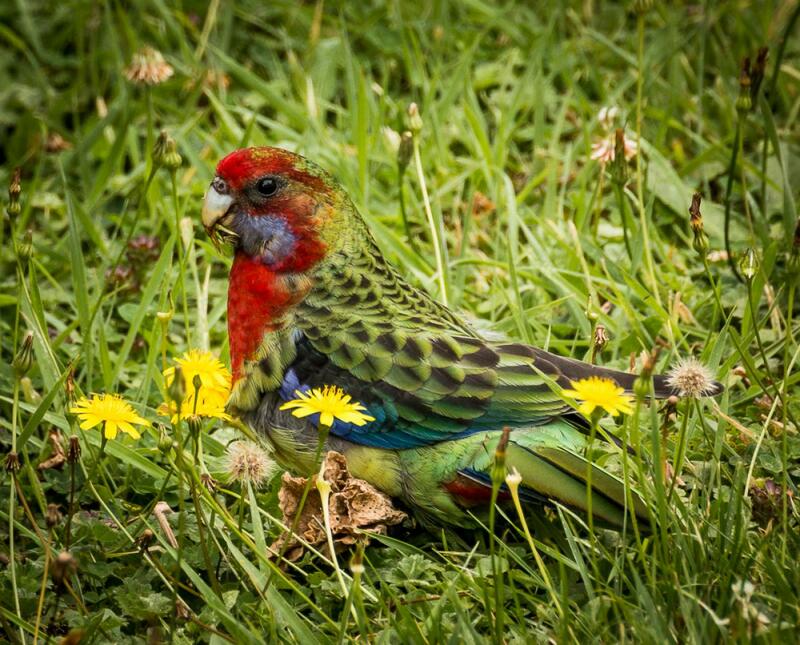 Clinical beak and feather disease virus infection in wild juvenile eastern rosellas of New Zealand; biosecurity implications for wildlife care facilities. New Zealand Veterinary Journal 62: 297-301. Krull, C.R. ; Galbraith, J.A. ; Glen, A.S.; Nathan, H.W. 2014. Invasive vertebrates in Australian and New Zealand. Pp 197-226 in Stow, A.; Maclean, N; Holwell, G.I. 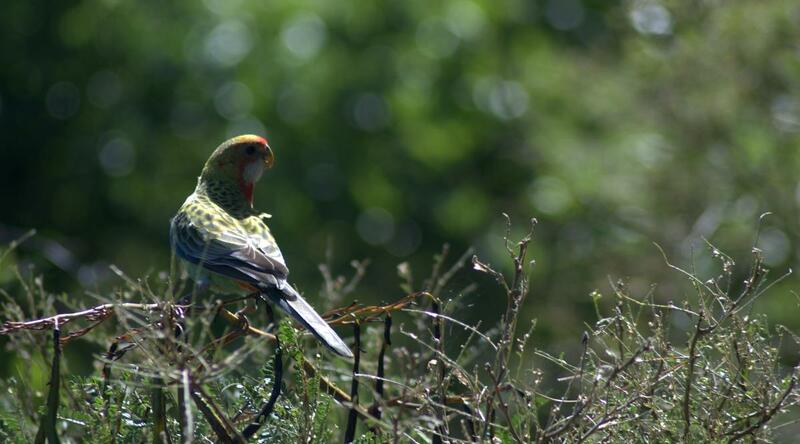 (eds) Austral ark: the state of wildlife in Australia and New Zealand. Cambridge University Press, Cambridge, UK. Massaro, M.; Ortiz-Catedral, L.; Julian, L.; Galbraith, J.A. ; Kurenbach, B.; Kearvell, J.; Kemp, J.; van Hal, J.; Elkington, S.; Taylor, G.; Greene, T. 2012. 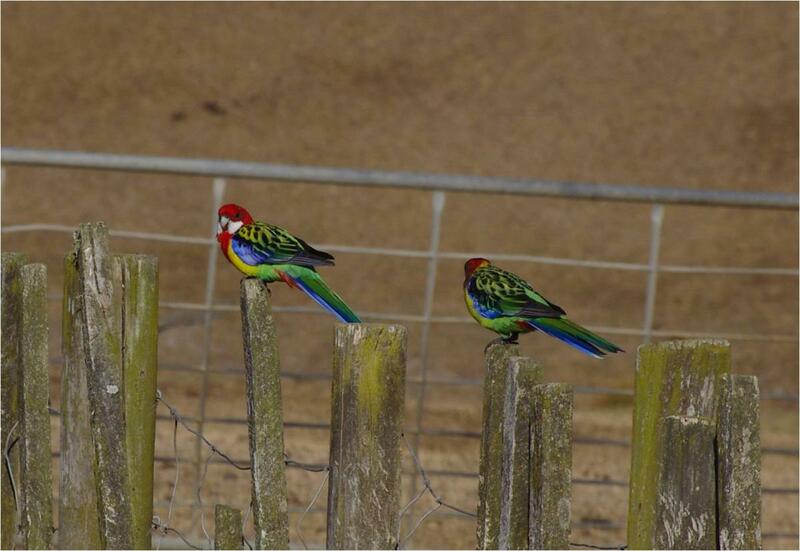 Molecular characterisation of beak and feather disease virus (BFDV) in New Zealand and its implications for managing an infectious disease. Archives of virology 157: 1651-1663. Woon, J.A. ; Powlesland, R.G. ; Edkins, C. 2002. 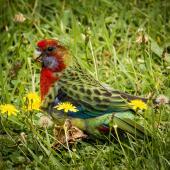 Observations of the eastern rosella (Platycercus eximius) in the Wellington region. Notornis 49: 91-94. Wright, D. 2001. 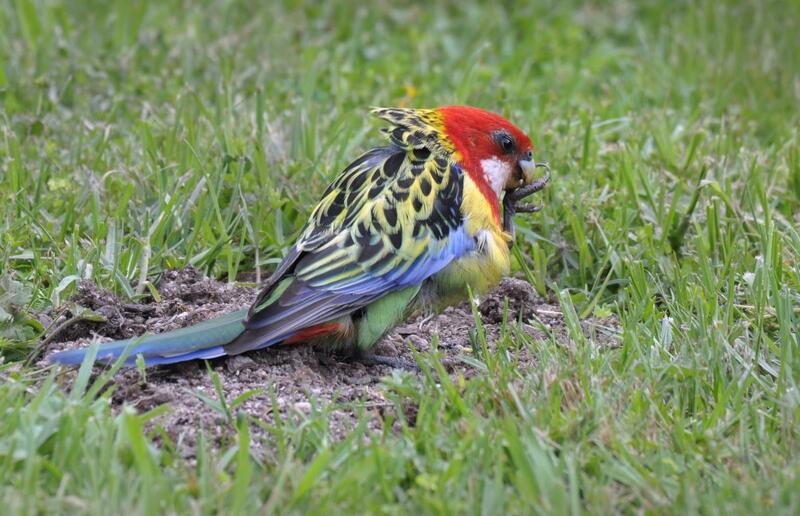 Population dynamics and nesting and feeding ecology of the eastern rosella (Platycercus eximius) in northern New Zealand. Unpublished MSc Thesis, University of Auckland, Auckland. Wright, D.; Clout, M. 2001. 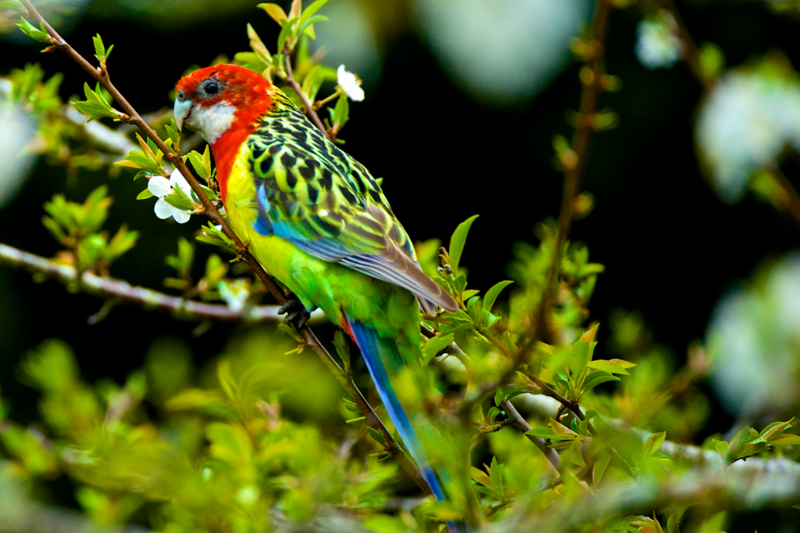 The eastern rosella (Platycercus eximius) in New Zealand. DOC Science Internal Series 18. Cavity nest with no construction of internal nest structure; will use pre-existing holes primarily in tree trunks or branches, but will use old burrows. 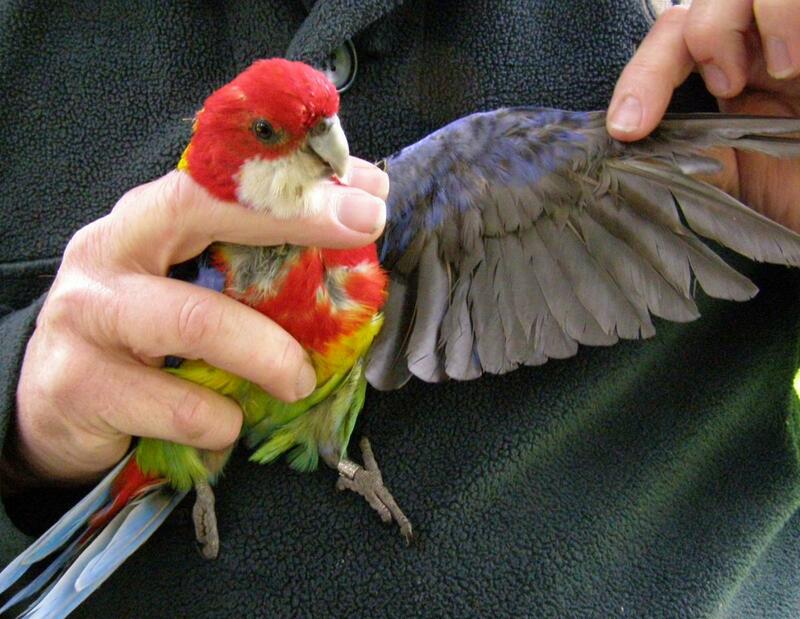 A medium-sized long-tailed rosella with a bright red head, white cheek patches, yellow belly. yellow-green upper back mottled with black, bright green rump, dark blue upperwings with bright blue shoulders, and dark green and light blue tail feathers. 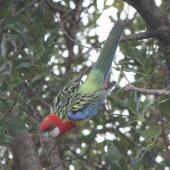 Males are brighter than females; juveniles are duller than adults, with greener plumage.